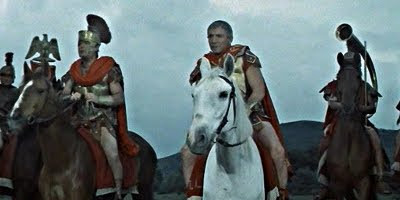 Following up Bava's Erik the Conqueror, Cameron Mitchell slaps on some old-age make up to essay the role of Julius Caesar in this disappointingly workmanlike account of the general's campaigns in Gaul. Mitchell is good, and peplum regular Rick Battaglia gives a reasonable performance as Caesar's Gaulish nemesis Vercingetorix, but supporting cast depictions of Cicero, Pompey and Mark Anthony are virtual cardboard cut-outs. Things never seem to get going under Tanio 'Amerigo Anton' Boccia's stagey, lifeless direction. Some of the scenes set in the forests of Gaul are so dull that one almost wishes that Asterix and Obelix would turn up and start throwing the cast around. No-one who has seen the first season of TV's Rome will be able to help seeing Boccia's film as anything other than a particularly tame am dram rendering of the same story. One for peplum completists only, then, but still better than some of the same director's Kirk Morris atrocities.